One of the most difficult thing in life is getting up early in the mornings. But this is never an issue when you have something exciting awaiting you. All of us were up and running by 5 that morning, and by 6 we were on the road again. 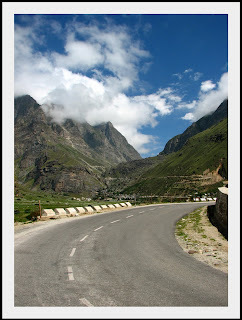 We got a shared sumo to Badrinath and after a roller coaster ride, reached there in less than 2 hours. Mount Neelkant was visible, shining brightly between the Nar and Narayan peaks. We checked into a small hotel (Priya) and by 9:15 we started towards Mana, the last Indian village before the Chinese border, some 3 kilometers from Badrinath. 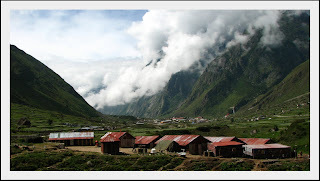 Mana is a beautiful village nestled between the mountain ranges. The road to Mana is well maintained as the Indo Tibetan Border Police has got a prominent presence there. There were potato fields all around and the plants were in bloom, giving a nice contrast to the deep blue skies and Grey mountains. You get some pretty amazing views as you walk towards Mana. We found an injured little barn sparrow on the road. We couldn't find any visible signs of injury on the body and hence left her on one of the bush, in the care of her mother who was flying around, chirping all the time. We reached mana in an hour's time. There are two caves in Mana - the Vyaas gufa and Ganesh Gufa, the place where epics like Mahabharatha were written. According to legends, Vyaasa used to sit in his cave and recite Mahabharatha while Ganesh used to write it all down sitting in the other cave. It is a profound feeling when you visit places like these, places that had a significant impact on life as we see it toady. There is a third cave called the 'Muchkund Gufaa' about 3 kilometers uphill from Vyaasa gufaa. Because of its proximity to the border, the army opens up the way only once a year, and it was that day of Janmashtami. Legend is that Sri Krishna had been in the cave while pursuing a deadly demon and there is a footprint inside which many believes to be of him. 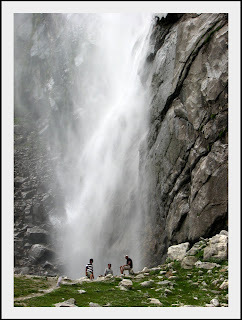 As we had to visit Vasudhara falls which is another 6 kilometers from Mana, we dropped the plan to visit Muchkund. But Yuvraj had other plans. He was busy documenting the scenes around that he didn't notice we walking down towards Mana village. He was under the impression that we had gone to Muchkund cave, and we thought he went ahead of us towards Vasudhara falls. So the rest of us walked towards Bheem pul and Vasudhara falls. We did not forget to have tea and click a few 'been there' pictures at the last Indian Tea shop, which is next to Vyaas gufa. Mana has lot of legends associated with it. It is said that sage Vyaasa was disturbed by the gushing waters of river Saraswathi while reciting Mahabharatha, and he asked her to go underground. There is a stream in Mana, supposedly Saraswathi, which is visible for a short distance after which it flows underground. Then there is Bheem pul, a big stone laid across the river by Bheem, when Draupadi was not allowed to cross the river as she was married to five people at a time. Vasudhara falls is on the 'Swargarohan route', the path taken by the Pandavas, after renouncing all earthly possessions, to reach heaven. A few minutes walk on the Vasudhara trail will take you to a small temple, one dedicated to Draupadi or Shakthi (whose reincarnation was Draupadi). According to the story, this is the place where Draupadi fell. Like the Pandavas, we carried on towards our destination. 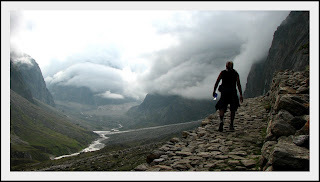 There views are awesome as you walk towards Vasudhara falls. There were some bushes all along the otherwise barren landscape, with bright red and orange berries on them. Though the signboard said 5 kms to Vasudhara, we felt it was more than that.. probably it was just our legs complaining. This trek was relatively easy without any steep climbs. The falls was visible at a distance and we thought its just a hill away. But we had to walk across atl east another 4 hills and a stream before we could finally reach it. Vasudhara falls drops from a height of 125 meters, but due to the height the water falls down like a shower of droplets. It was really cold out there and only Jayan managed to take a shower. The rest of us sat there watching the falls and the mist covered valley below. The tranquility of the place was amazing, no wonder why all the yogis choose to go to the Himalayas to meditate. 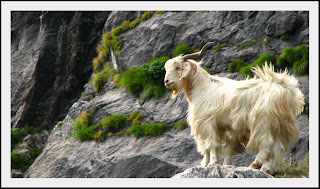 There were a bunch of goats roaming around the hillside, guarded by two sheep dogs. After spending an hour when we were about to return, we saw Yuvraj walking towards us. He had gone all the way to Muchkund cave, and not finding us there decided to check out the falls. 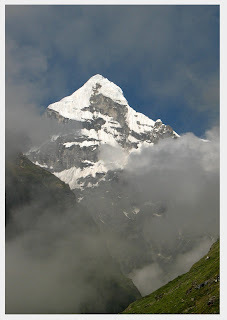 As we had to reach Badrinath by 6:30 to visit the temple, we made haste and in about 2 hours were back in Mana. All of us took bath quickly and proceeded towards the temple. There was a decent crowd at the temple, but we managed to get Darshan without much trouble. There is something quite captivating about the atmosphere in a temple, don't know whether its all the lights and chants or the crowd. I sat outside the sanctum-sanctorum, watching the pilgrims and their actions while Subbu and Jayan went inside for the third time. 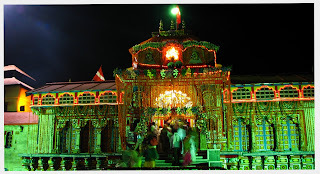 The temple compound was well lit with diyas and fires and some special functions were going on due to Janmashtami. There was a board displaying the price list for various offerings to the god, the highest one priced at Rs. 17,000. There were only 4 of the 27 items with a sub-thousand price tag. Even gods seem to be suffering from inflation and recession!! I would have loved to spend a little more time there, watching the proceedings, but the cold was getting to on to us. Listening to Subbu's explanation on why we accept the 'prasadam' from the temple and put it on our head, and trying to crack walnuts with teeth, we walked out of the temple complex. All of us were hungry and had dinner at hotel Saket. By this time Rob had gone and booked tickets for our return journey to Haridwar the next day morning. It is said that the sufficient excuse to visit a place is that it exists. I think we too didn't have any better reason to come all the way and walk about 85 kms in five days. But at the end of it all, looking back, we felt fortunate, blessed and happy, being exposed to such profound beauty and grace of nature. We were probably the largest congregation of content souls on the face of earth that night!! !